Keeper Jens Lehmann has extended his contract at Arsenal for another year. The Germany international's deal with the Gunners was set to run out this summer but he will now stay at the Emirates Stadium until 2008. Lehmann told Bild magazine: "I'm going to stay an extra year, Arsenal's a great club with a good outlook. The 37-year-old wanted a two-year extension but Arsenal's policy is only to offer one-year deals to players aged over 30. Lehmann's decision will disappoint Bundesliga outfit Hertha Berlin, who fancied their chances of landing the keeper at the end of the season. The big draw for Lehmann is the chance to play in the Champions League next season, with Hertha lying seventh in the Bundesliga and unable to qualify. Lehmann was sent off in last season's Champions League final against Barcelona and admitted: "I want to play in the Champions League next season." Since joining Arsenal from Borussia Dortmund at the age of 33, Lehmann has signed three successive one-year contracts with the club. 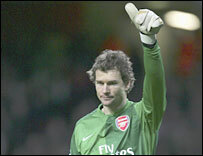 Lehmann has retained his status as Arsenal boss Arsene Wenger's first choice ahead of Manuel Almunia and Mart Poom. But Wenger revealed he expects Lehman to be pushed all the way by Almunia. "I see Jens as a top-glass goalkeeper and Almunia as a top-class goalkeeper, so it will be a battle at some stage because Almunia has improved tremendously," said Wenger. "Manuel is going up and Jens thinks he is still going up! "Jens is trying every day to make life difficult for those who compete with him. That is very good because it makes those who are competing with him improve as well. "He is a 100% professional. He gives something to the team as well in the dressing-room if it is needed."